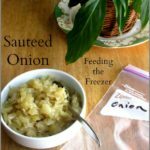 Freezer meals for the pressure cooker! 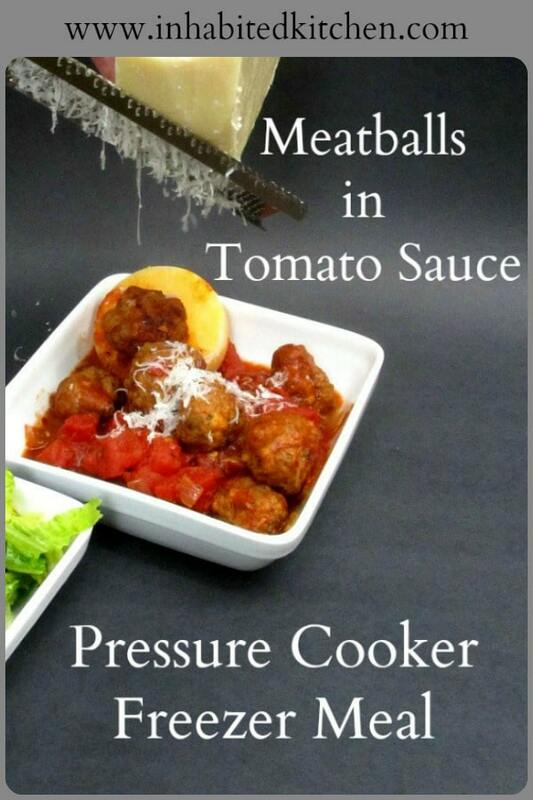 Toss frozen Meatballs in Tomato Sauce into the pressure cooker, set and forget for an easy dinner. Spending a whole day (or weekend!) cooking intensively never appealed – and it’s just not a great idea with my migraines. (Can you imagine being halfway through making a month’s worth of meals and starting a severe migraine?) I don’t have the freezer space anyhow… even now, with twice as much (but twice as many people.) Opening a can to pour the contents into a bag to freeze, as many recipes ask you to, always seemed silly to me (especially with limited freezer space…) And it just didn’t work for me. Besides, my greater need was different. 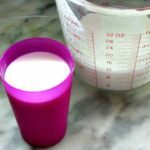 The problem wasn’t starting a meal in five minutes in the morning, as planned… Instead, I’d have a perfectly good planned meal that I could easily fix in the time I expected to have – and then I would hit a delay coming home. Or I would have one of those migraines (and Rich would heat chili – again…) So I stocked cooked components – cooked meat, frozen vegetables, polenta or cooked rice… I could throw them into a pan (perhaps with sauce) and serve in ten minutes – or tell Rich which ingredients to pull out and heat. I needed options. Days with migraines, days the errands took longer than expected, days I couldn’t leave when I planned to because I was here with the therapist or the HVAC repairman… But my old technique doesn’t work as well, because the meal is more complex. Ten minutes before I serve, I’m tossing salad (with three kinds of greens and three to four other vegetables) and placing serving bowls, Rich needs to pour ice water and wine now, so he can help his mother to the table in a few minutes, and everything is much more hectic. I started to wonder about freezer meals for pressure cookers. I already pre-brown meat to drop into a slow cooker or pressure cooker without the initial step of browning. I already made Once in a While Meatballs. 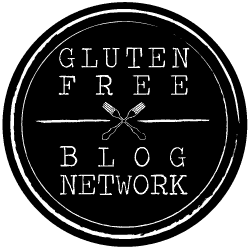 (OK – that recipe predates my knowledge that I need to avoid gluten. If you don’t, use as is – if you do, use commercial GF breadcrumbs. And boy, does that recipe need new pictures…) So far I think these meals work best with food frozen in separate pieces, not a block, and of course unfrozen liquid to start the cooking. A week or so before, I made a double batch of Once in a While Meatballs (adapted to be gluten free, of course.) 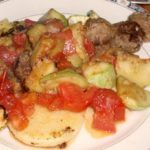 We ate some that day, and I divided the rest into quart freezer bags – so roughly one pound of meatballs per bag – enough for one hearty dinner for the four of us. I reserved one for another use (meatballs in soup? Meatballs in other recipes?) and used two – the equivalent of one of my meatball recipes – for this recipe. Chop an onion, and mince two cloves of garlic. Heat a little olive oil in a pan, and saute until soft, but not fully cooked – they will finish cooking later. Let sit a few minutes to cool. 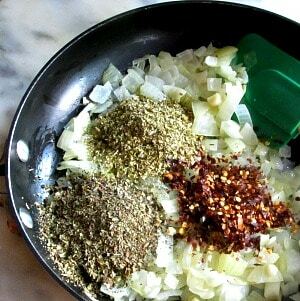 Add one teaspoon of crushed red pepper, two teaspoons of dried basil, and two of oregano. Stir all of this well into the onion mixture in the pan. Take your frozen meatballs – my recipe, your recipe, commercially frozen ones – whatever works best for you. To serve four at a time, place roughly a pound in each of two quart bags. Now divide the onion mixture in two, and spoon half of it into each bag with the frozen meatballs. Seal the bags, and place in the freezer, for later use. Get one of the bags out of the freezer, and one 28 ounce can of diced tomatoes. Open the tomatoes and pour them into your pressure cooker, then pour the contents of the freezer bag in on top of them. Close the pressure valve, seal the cooker, and set it for ten minutes at High temperature. Once the time is done, let the pressure come down naturally – after ten minutes you can release any remaining pressure, open the cooker, and serve. This does take about half an hour all together in the pressure cooker, but that’s not your time. Once the pressure is set, you don’t have to even look at the cooker until it is ready to eat. So you can walk in the kitchen door, throw the tomatoes and meatballs into the cooker and set it – maybe five minutes? – and then fix whatever else you want to serve. Or even leave the room. Change your clothes, talk to your spouse, check the mail… Or just sit down, because you are tired. Dinner will cook itself. 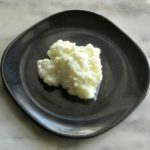 I just serve it over microwaved polenta – homemade if I have it, or the commercial kind out of a tube. Add a salad if you want (there always needs to be a good salad, in this house, but that’s up to you) maybe microwave some vegetables – and you’re ready to eat. The diced tomatoes break down into a chunky sauce, and pick up the flavor from the meatballs and seasoned onions, and you have a good simple sauce. If you want to serve only one or two people, divide the meatballs into four bags, then use a 15 ounce can of tomatoes instead of the 28 ounce. You can’t really go smaller than that, because of the liquid the pressure cooker needs to work, but this will reheat well. 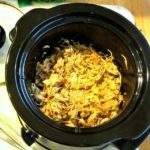 This becomes a good recipe to make for someone else who has and can use a pressure cooker, but may not be able to spend time in the kitchen chopping and sauteing, or even watching a saucepan. 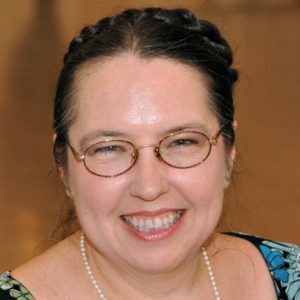 An elderly parent who is comfortable with the gadget but can’t stand long, of course – but a friend who hurt his foot, a neighbor with a new baby or a sick child… There are any number of people who could throw something into the pressure cooker, but not stand over a stove. or even stay in the kitchen any length of time. Set this up, leave for half an hour or so, come back and your main course is ready to serve. I have adapted it, of course, for a gluten free diet. 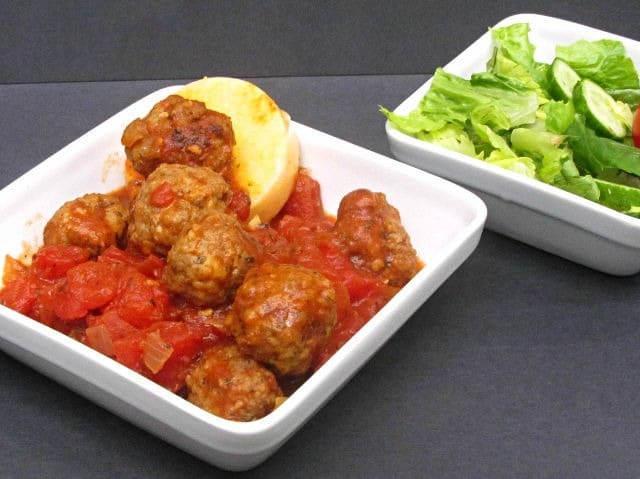 These meatballs are quite soft, you can make them smaller if you need to, so they are easy to chew, and the sauce keeps them moist for easy swallowing. 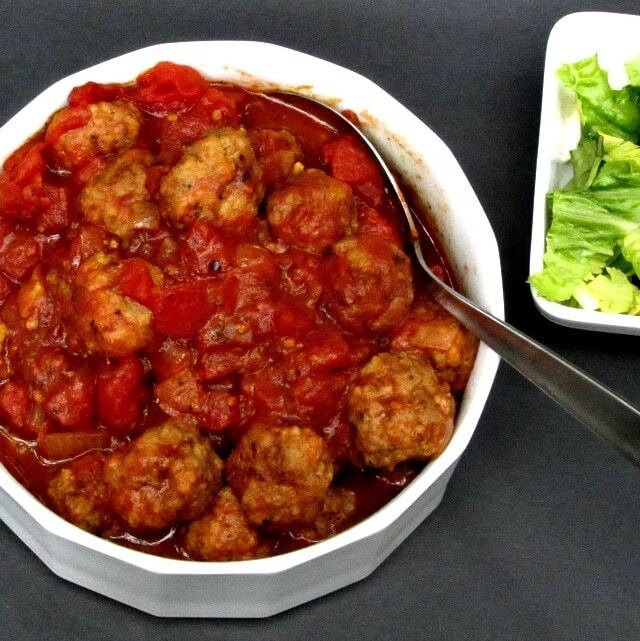 You can use chicken or turkey in this meatball recipe, or use your own, to lower the fat. 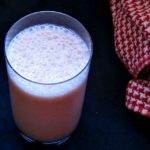 I did not add salt, because there is usually enough in canned tomatoes – you can use low sodium tomatoes if you need to go lower. There are vegetarian “meatballs” if you want a vegetarian version. Chop onion and mince garlic. Heat oil in pan, saute onion and garlic until soft and golden. Do not cook completely. Turn off heat, and let cool. Add seasoning to pan, and mix well. 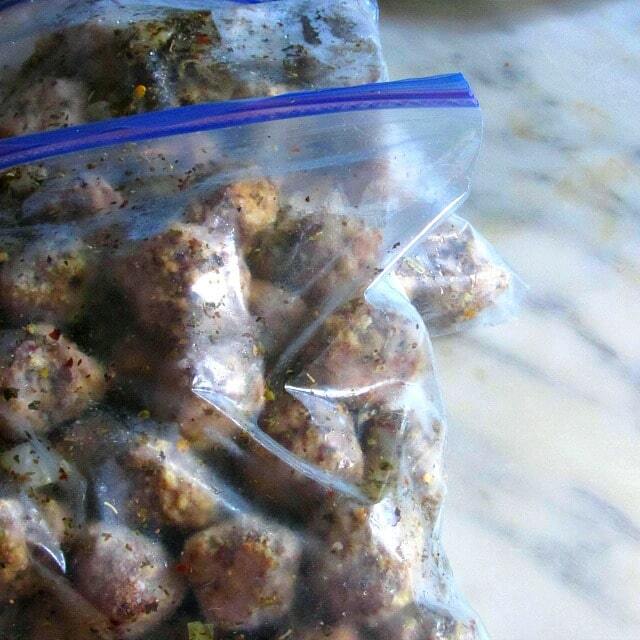 Place one pound of still frozen meatballs into each of two quart freezer bags. Divide onion mixture in half, and place half in each bag. Return bags to freezer. Open a 28 ounce can of diced tomatoes, and pour it into a pressure cooker. 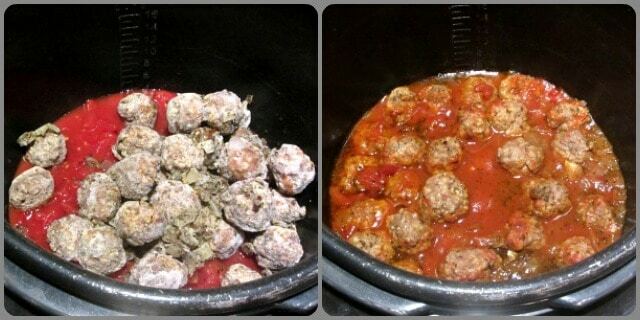 Take one bag of the prepared meatballs, and empty it into the pressure cooker, on top of the tomato sauce. Close pressure cooker and seal valve. Set for 10 minutes on High. Turn on and let cook. When it finishes cooking, allow a natural pressure release for at least 10 minutes.If it takes longer, you can release manually. Serve with microwaved polenta, to keep things fast and easy. I list all the time in the pressure cooker under Cooking Time - it only takes 10 minutes of actual cooking under pressure. The rest is coming up to and down from pressure. Directions for 4 meals of 2 servings each are in the body of the post. I love anything that can help to get dinner on the table in a more timely manner, especially on weeknights. This is a great idea. I love how you've added everything except for the tomatoes to the bag for the freezer. I will definitely be making this the next time I make freezer meals. It's much easier this way. Great idea. I'm all about easy freezer meals right now since we're about to have a baby! This recipe would be so perfect to make in advance and freeze for later. Can't wait to try it out! These kind of meals are so crucial for busy nights. Working full time with two young children, there is ALWAYS a snafu at work that leaves me rushing in the door at 7:30pm with a hungry 3 year old. Anything we can make ahead of time is such a big help! 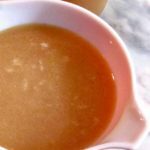 I love the easy dinner recipes and this looks like a lifesaver. Wonderful recipe. 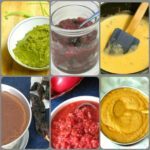 Your recipe is doubly easy to make! Between work and two little kids I always need to have a few meals at the ready for extra busy days. This one meets that need perfectly. Thanks for the idea! I'm with you on the usual thought process of freezer meals. I mean, I'm all for leftovers, but not everything is delicious recooked. HOWEVER, these meatballs look super easy and super delicious! Definitely something that would be a big help when we're in a pinch to get dinner of the table and 3yo approved. Freezer meals are a lifesaver for busy and big families. I am not used to cooking and freezing for later use, but it's good to see that they can turn out as delicious as these meatballs in tomato sauce. This recipe sounds so easy and it surely looks like something my family would love to have for dinner. I'm saving this to try. Sauce sounds sooo good and flavorful. This sounds like a great replacement for a drive thru dinner. Do you have a brand of meatballs that you recommend? Winner, winner, meatball dinner!! Freezer meals are becoming ever more important here. Having a pressure cooker recipe makes it all the easier. Wow I need to spend more time preparing freezer meals. I'm so busy with work and family that this will be great to save time. I have been meaning to get an instant pot for some time and recently had a friend ask me to buy one so I can teach her how to use her's. We love meatballs and this recipe with tomato sauce sounds like one our family would use a lot.